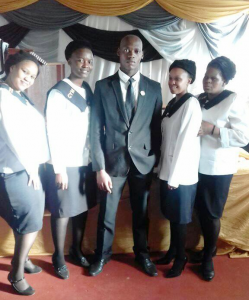 Khanyisani Mbatha with women of URCSA uThukela Presbytery’s management team, he is the chairman of the Youth Ministry. Nhlalakahle’s youth got a jump start for their post Grade 12 futures like never before! Where their pass rate had always been very low (sometimes as low as 12 %), it increased to about 40% in 2017 and five of the students passed with matriculation exemption. This is great news! But how did it happen? These school children were used to tribal fights that disrupted the school and they often had to attend classes with guns to protect themselves. This enormous change came about as a result of the impact of the “Transformers”, the youth leaders who inspire and support these school children on a regular basis. After one year of weekly visits, a grade 12 camp, a second camp and the annual outreaches from Bredasdorp many children’s futures look much brighter. The youth workers plan to reach one thousand teenagers during camp outreaches this year and have already received 500 Zulu Bibles to hand out during that time. We pray for Khanyisane Mbhata, an unemployed young man who started volunteering with the youth program a few years ago, underwent training, and devoted himself (without payment) for more than three years to youth work. Luckily we could appoint him as part-time youth worker for Nhlalakahle from the beginning of 2017. He goes to Nhlalakahle for two days each week where he visits the schools, offers life skills programmes and then sees to it that these children attend youth camps. The Grade 12 camp is already an annual event, but two junior schools are now also involved. We pray for Khanyisane Mbhata (who does his work with great enthusiasm) and we thank God for Sihle Madonsela, one of the volunteer youth workers who works as youth evangelist and counsellor, who has a major influence on many teenage boys. Contact Lourens Schoeman at lourensschoeman01@gmail.com for more information.